The other day my friend and I were hosting an integrated playdate. 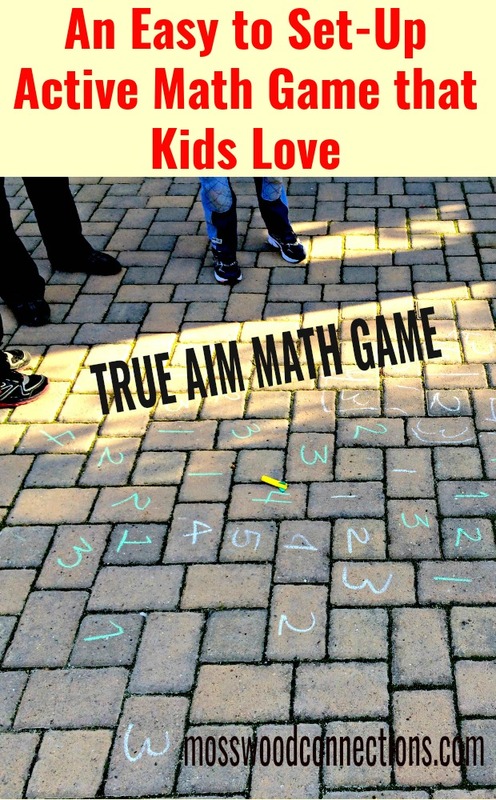 We came prepared with a wide variety of activities including this True Aim Active Math Game since you never know which game or activity will engage the kids that day. As always, the games that we thought the kids would love went okay but they got really excited when we pulled out a game that incorporates math and motor skills. Kids are great, they love learning when it is presented in a way that they can connect with and enjoy, that’s why we always try to sneak some learning into fun games and activities. The kids really enjoyed this game. Probably because we used some fun squeeze rockets. They really got excited about adding the numbers up to get the biggest score. Then they got competitive and realized their scores would be higher if they multiplied so they added a level of difficulty to their game. Write numbers randomly on the ground with the chalk. Draw a line where the kids will stand. Have the kids take turns squeezing the rocket towards the numbers. Whatever number it lands on is the number they get. If it does not land on a number it equals 0. For failure sensitive kids you may let them take another turn. Encourage the other children to be generous with “redo’s”. If you want to work on skip counting either make a lot of odd numbers or a lot of even numbers. Have the kids aim at the next number to skip count. If the skill that you are working on is math facts then have the kids aim for 2 numbers and add them together or multiply them together. The largest sum (or product) wins. 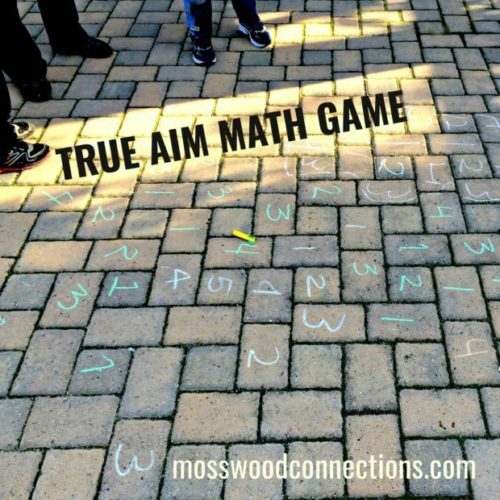 For team play, pair up the kids and have them each aim for the number one time and then add or multiply their numbers together for a combined team score. Encourage the children to encourage and cheer for each other, make sure to keep the competition positive. There are so many ways that you can play this game! What are your ideas? We find that active learning helps a child learn new concepts and to retain the new information, that’s why we often incorporate being active into our learning goals. Math and Movement actually has an entire curriculum based on active math games and activities. There are many active math games that get the kids excited about learning, maybe you want them to run and race on a number line. Maybe you are in the mood for a math scavenger hunt. Whatever the activity, it’s easy to add skills in while the kids play games.